Reflections are excited to announce we are one of the first salons in the UK to become official providers of Olaplex - the incredible new treatment transforming the hair industry. Olaplex contains a single active ingredient that will reconnect broken bonds in the hair - hair is softer, stronger, more glossy - and these results are PERMANENT. It’s rare that a product comes along that will change the way we colour hair forever - but Olaplex is that product. Its a miracle treatment that offers anyone who uses colour the chance of healthy, shiny hair - no matter how often they change their colour. Already loved by celebrities such as Charlize Theron and Kim Kardashian, the treatment (which can be included in your next colour or booked separately) costs just £30 and takes a maximum of 15 minutes. Ask for Olaplex to be added to your next service and see the AMAZING results for yourself. 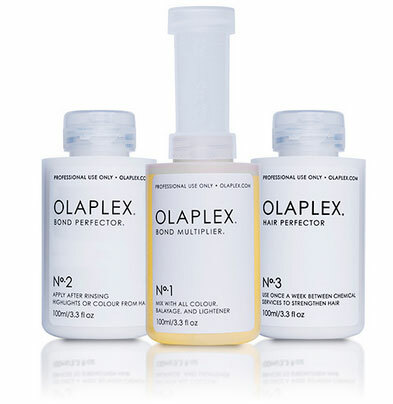 Purchase Olaplex No 3 Hair Perfector and continue to strengthen your hair and rebuild broken bonds between your salon appointments! But be quick, this product is VERY popular and we only have a limited stock!